We arrived in Key West yesterday afternoon and it's just as beautiful and unique as I pictured in my mind. We're here to shoot the wedding of Serena and Dan this Saturday at the historic Ernest Hemingway House. Whenever we're getting ready to head to a destination wedding, we always like to do a little research about the best places to eat and great things to see there so that we can make the most of our trip. We're big into food and we like to make note of the restaurants that have been featured on Food Network and Travel Channel as well as talk to locals once we get there to find out their personal fav spots to check out. I thought I would write a little diary of our stay here in case any of you are planning to head to the southern most point in the US and tell you about the spots we visited to help with your own travels. We're staying at the Days Inn Key West which has turned out great for us. It's the first hotel you see when you get on the island (so we didn't have to look far). Even though All of the action is on the other side of the island, as you head closer that way the price tag also sky rockets. The great thing is that the island is only 2 miles by 4.5 miles, so wherever you stay you're really not far from anything! Once we dropped our bags our first stop was B.O's Fish Wagon. A dive little spot on the corner of Caroline and William that is hard to explain without pictures. This spot is basically built around a gathering of trees. Just a few wood posts and a tin roof with a whole lot going on once you walk in. There are license plates, nautical things, and really….anything and everything covering the wood plank walls. Names are carved and written everywhere marking people’s visit there. We tried the Key Limeade - AMAZING! And the grilled Italian seasoned shrimp skewer and their famous Key West hot dog. All very tasty! Bobby Flay visited this place on one of his shows, and the fish sandwich is the thing to try. However, not very seafoody me wasn't about to venture in that direction. But we loved what we got and were ready to try the next thing. We made a quick stop at Kermit's for some Key Lime Pie and tried a million free samples everything from Key Lime Jelly Beans and Cookies to Mustard and BBQ Sauce. Everything was really tasty! 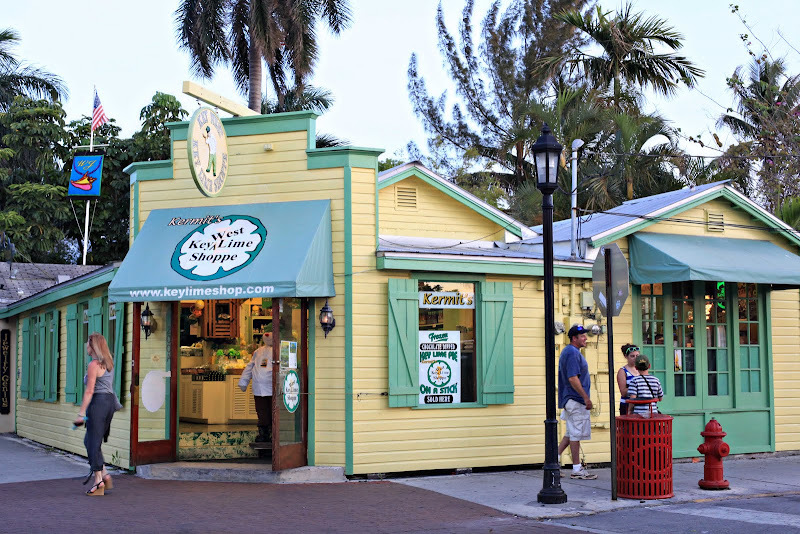 I think there's debate over the best place to pick up Key Lime Pie - but I suggest try it all! We wandered around the narrow streets and took a few shots of the gorgeous surroundings. The landscape is so full and lush with palm trees and flowers. And check out these amazing root systems weaving all over. Just Beautiful! The water is the most gorgeous color. Don't you just want to dive in? We stopped in at a seashell shop by the shipwreck museum that has TONS to choose from. I bought a few Knobby Starfish to create some unique summer beachy wedding hairpieces, so stay tuned for those creations! We had dinner at Sloppy Joe's which was one of Hemingway's favorite hang out spots. Originally opened in 1933 by Joe Russell, it went through several name changes before Hemingway suggested it's current name. Again, I'm not a huge seafood lover but I do like a few shrimp once in a while and we wanted to try the freshest of fresh peel and eat shrimp which was incredible!! It doesn't even really taste like the shrimp cocktail that I know. Todd did all of the peeling, and I just enjoyed! When it comes to shrimp I can usually eat about 2 or 3 before I'm good for a long while, but we shared a big basket and only left one or two behind between the two of us. They had an awesome live band that was really great, and we got in there before the rush. We sat down to eat at about 6:30, but places don't really get packed until the nightlife scene starts around 8pm. Before we were done with dinner, I snuck out to get a quick sunset shot from the water down the street. After that we stopped at the Ice Cream place on the adjacent corner to get some dessert while we walked around. When we stepped out, there were several police motorcycles blocking off streets with crowds forming. Of course we wanted to see what all the action was about. What we didn't know was that today is the Conch Republic Independence Day. Wikipedia explains (we had no clue! ): The Conch Republic is a micro-nation declared as a tongue-in-cheek protest secession of the city of Key West from the United States on April 23, 1982. There was a parade to celebrate. Many of the local restaurants, businesses, and organizations dressed up their antique cars, bicycles, and scooters and held up signs promoting everything! Healthy living, recycling, the Old Car Club…just about anything you can think of! The people walking alongside the "floats" were all dressed up in a million different random outfits while throwing bead necklaces and candy. Todd grabbed a tootsie roll. It was quite the experience that we weren't expecting but was a nice surprise and a great way to end the evening. Stay tuned for Day 2 of our adventures and for the blog of the wedding we're super excited about being here for!